Happy Sunday! I hope you all had a great weekend. I am so sorry about the lack of posts this week. As most of you know I was at #ITWBNBloggerEvent on Sunday. I had a brilliant day and left feeling so so inspired and motivated about blogging. My only problem is now I have so many ideas I need to take the time to plan and organize my time. So over the last week or so I have been reading #GIRLBOSS by Sophia Amoruso. This is my second time reading it and I really enjoyed it. I think it is the perfect book for anyone in business or trying to create the life of their dreams. So I decided to do a quick review just so you can get a little insight into the book. Sophia Amoruso is the founder and CEO of Nasty Gal. Nasty Gal is an online store retailing vintage clothes. Throughout #GIRLBOSS Sophia tells her story about how she rose to the top and how she grew her business from strength to strength. She shares her secrets to success as well as inspiring others and teaching her fans and readers how to be a #GIRLBOSS. Sophia says it as it is and is very honest when talking about her past. She is an open book and is very comfortable with who she is. She is witty, hard working and inspiring to women every where. She encourages her readers to believe in their dreams, work hard and to do what ever it takes to get where you want in life. I loved this book and would definitely recommend it for any girl trying to figure out what they want in life. Sophia may not have all the answers but you will be amazed at where you find some inspiration. 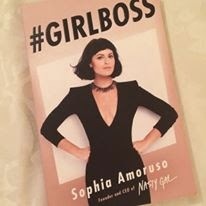 #GIRLBOSS is available to buy online here as well as all good book stores!